Like a lot of you folks, I also had the question, what is cloud computing? I started googling and downloaded a few tools and played with them and now understand a few concepts. There are few leading players in this space, such as Salesforce.com (Heroku, Force.com) and Microsoft (Azure). Recently VMware entered into this space with their own Cloudfoundry. 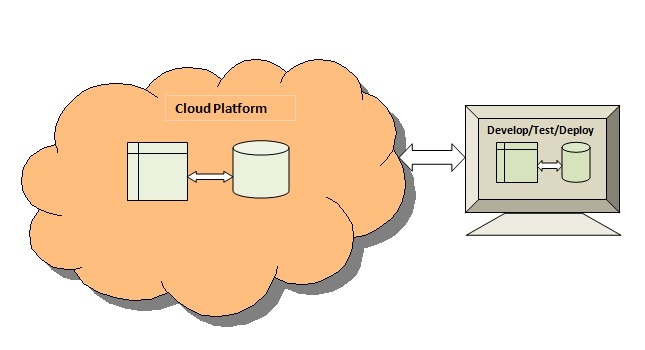 Coming from Java background this is a good tool to understand the details of a Cloud Platform. It is well integrated with STS IDE and it is bit buggy, but there are workarounds. I will walk you through a simple example using Spring MVC and MongoDB, where you do a basic CRUD operation on person table. MongoDB is a Document based database, which is used to store large amount of data, this also has Map/Reduce capabilities similar to Hadoop. WebServer and database support: Cloudfoundry Supports SpringSource tc Server, and it also supports Jetty if used with Maven. Database side,It supports MySQL, vPostgres and MongoDB. It has the ability to introspect spring context file and understand which type of database application supports if you have a bean with type “org.apache.commons.dbcp.BasicDataSource” and it can bind it to the respective database. If it is MongoDB, it needs a mongo-db-factory as shown in this example. Database seed data population: Typically if you have “jdbc:initialize-database” configuration in your application Cloudfoundry will execute that script in its bound database. For setting up your STS to work with Cloudfoundry refer this link. Create a new Cloudfoundry Server and add the spring-mongodb application, and publish the application war to the Cloudfoundry host and see your changes. Other than these changes, everything else is same as any other Spring MVC application. Way forward, you can get the Cloudfoundry samples. Using Git utlitiy you can clone this in your local machine. There is a simple hello-spring-mysql sample; you can quickly understand how MySQL based application works using this example.